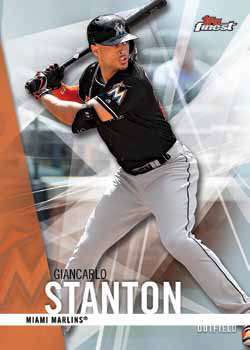 2017 Topps Finest Baseball arrives Wednesday at Sports Cards Plus (call for Best Price in The Galaxy) with the brand go back to being a hobby-only product. As with the past, the designs are bright, the colors are many and autographs are a major focus in 2017 Topps Finest Baseball. Rookies and veterans are both featured in the 2017 Topps Finest Baseball main set. The checklist includes a total of 125 players. The final 25 are short prints. Parallels come in the form of Refractors. In addition to basic Refractors, colors come in Purple, Blue, Green, Gold, Orange (/25), Red (/5) and Superfractor (1/1). Every 12-pack box (two six-pack mini boxes) of 2017 Topps Finest Baseball includes a pair of autographs. All signatures are on-card. Finest Autographs hone in on current players, both rookies and veterans. Finest Firsts Autographs are similar in design except the checklist consists entirely of 2017 rookies. Numbered Refractor parallels for both come in Blue, Green, Gold, Blue Wave, Red Wave, Orange (/25), Red (/5) and Superfractor (1/1). The Blue Wave and Red Wave versions are new to 2017. Used in the past in Bowman Chrome, Wave Refractors have a patterned background. Finest Finishes Autographs highlight big finishes from baseball’s history. These are inserted as a case hit. Parallels include Orange Refractors (/25), Red Refractors (/5) and Superfractors (1/1). 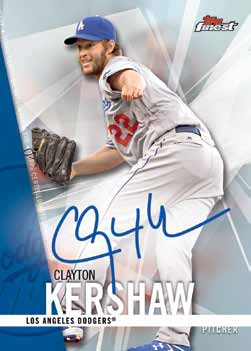 Original Topps Finest cards from the past have been signed and inserted as Finest Originals Autographs. Some of the inserts in 2017 Topps Finest Baseball cross over into basketball. No, Topps hasn’t landed an NBA license. Rather, the 1994-95 Finest Basketball design has been applied to current and retired baseball stars. Finest Breakthroughs use a bold design to spotlight young players. Finest Firsts isn’t just an autograph insert. There’s a basic version as well, also highlighting rookies. All three of these insert sets have Orange Refractor (/25), Red Refractor (/5) and Superfractor (1/1) parallels. 1994-95 Finest Basketball and Finest Breakthroughs have limited numbers of autographed versions as well. After highlighting Derek Jeter and Ken Griffey Jr. over the past couple of years, Finest Careers Die-Cut inserts shift to the recently retired David Ortiz. These fall two per case. Refractor versions come in Orange (/25), Red (/5) and Superfractor (1/1). A small amount of autographs have also been inserted.